For today’s deals roundup, we’ve put together a bunch of gadgets in the list that includes a couple of speakers, earphones, and even some storage devices. Whether you’re on the lookout for a hard drive or an earphone, we’ve got you covered. We searched on Paytm Mall to find a bunch of impressive deals across a variety of gadgets. 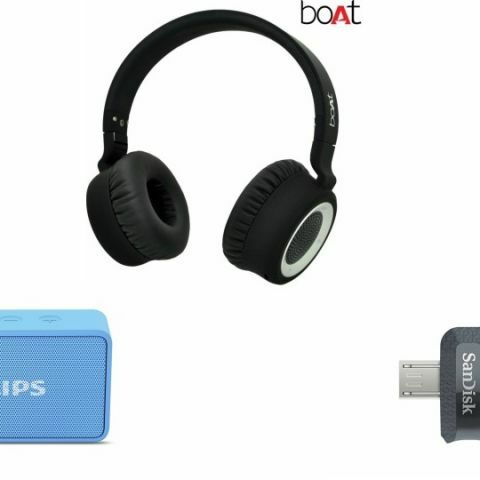 The list contains products from brands like Philips, Sony, SanDisk, and more. The SanDisk 32GB Pen Drive comes with USB 3.0 connectivity, which, as per the company, is capable of transferring data at speeds of 130Mbps. It features a micro-USB connector and USB 3.0 connector as well, which lets you transfer files directly from your Android device to a computer. You can purchase the device here. The 16GB HP pen drive features a USB 2.0 connectivity, which is said to transfer and read data at rates of 14Mbps and 4Mbps respectively. The company is also providing 2 years of warranty that covers both repair and replace. You can purchase this device here. The 32GB Sony Micro-Vault USB Pen Drive sports a retractable design that protects the connector from gathering dust and other damages. It features a USB 2.0 connectivity and also enables users to protect their files from an unauthorized access, via a pre-loaded software. You can purchase this device here. Western Digital's 1TB External Hard Drive features USB 3.0 connectivity. The company claims that it can transfer files at 5Gbps. You can purchase the device here. The Seagate Backup Plus Slim 1TB external Hard drive sports USB 3.0 connectivity and is also compatible with USB 2.0. The company says that it can transfer data at peak rates of 120Mbps on USB 3.0 interface. You can purchase this device here. If you someone who prefers on-the-ear headphones, then the boAt Rockerz 430 could be worth trying out. The device features Bluetooth 4.1 technology and offers passive noise-cancellation. It comes with an in-line remote that enables changing the tracks and the volume. It also enables users to stream music via an AUX cable when the headphone runs out of battery. You can purchase this device here. The boAT Bassheads 225 In-Ear Headphone features a tangle-free flat cable for hassle-free storage. It features an in-line noise-cancellation microphone that lets you receive calls without any inconvenience, even in a noisy environment, says the company. The headphones are equipped with 10mm dynamic drivers and it weighs around 80gm. You can purchase this device here. The Zoook ZB-Rocker M2 is a portable wireless speaker that supports streaming music via Bluetooth, AUX and USB cable. The device is backed by a 3000mAh battery, which is said to provide 6 hours of audio playback on a single charge. You can purchase this device here. The F&D W12 water-resistant Bluetooth speaker can stream music via microSD card and AUX cable, aside from the regular audio streaming via Bluetooth. As per the company, it can deliver six hours of audio playback. You can purchase this device here. The Philips BT64A sports a built-in microphone that lets you manage calls when the phone is connected to the speaker. The device is also equipped with FM radio and a microSD card slot. You can purchase this device here.